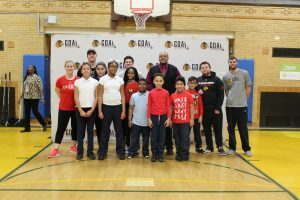 Youth hockey coaches from the Chicago Blackhawks Get Out and Learn (GOAL) program visited Emerson Elementary School on Thursday, February 7, 2019, and students had the opportunity to learn some basic hockey skills. The skills that youth learn through sports like hockey-teamwork, focus, the value of hard work, practice and perseverance-will benefit them in school today, in college tomorrow and throughout their lives. The school received (2) one-hour clinics from the Blackhawks youth hockey staff, and P.E. teachers are invited to a training session at the United Center. The school will also get to keep the equipment used in the clinic for the PE classes, which includes 30 Blackhawks street hockey sticks, 30 hockey balls and two nets. Thank you to Mr. Roy Anderson for organizing this opportunity for our students! To view additional photos from the event, visits Emerson’s Facebook page by clicking here.